Tag Archives for " backpacking "
Backpacking is a great way to spend some time in the lap of nature. One of the most important things while going backpacking is to take nutritious meals with you. You won’t find eateries or restaurants when you’re out on a trail or camping in a forest, but you can always carry ingredients that can be cooked easily with very few supplies. Another important aspect of backpacking is to avoid carrying too much weight which is why carrying ingredients for regular meals doesn’t make sense. 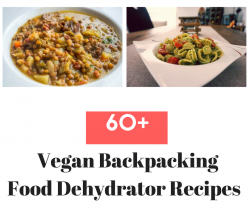 In such cases, dehydrated foods, dried ingredients and snacks come up as the best option for backpackers who want to eat nourishing and filling meals while they’re trekking or going on a trail. Freeze-drying is not the solution you are looking for, if you want to hit the trail and you want to follow a vegan diet. Backpacking meals which are freeze dried are light on vegetable content and loaded with starch. If you want to tap the wonders of fruits and vegetables and access a vegan diet, dice veggies like tomatoes, onions and peppers and dehydrate them using these innovative recipes. Fruitarians will also celebrate the dehydrator for its powerful performance when it comes to making leather and fruit roll ups. Veggies such as green beans and broccoli benefit from steaming. Retain the natural color, aroma and nutrient value of vegan food by opting for dehydrators.